The relationship between art and science has been fractious since the Enlightenment, when practices that had often been seen as alternative ways of approaching the same truth began to be separated into competing theories. Aesthetics, scientific method and philosophy were spun out with a kind of intellectual centrifugal force. In recent years there have been attempts to reconcile art and science, some more successful than others. Too often they seem rather mechanistic: artists using scientific material they do not understand as exotic stuff from which to spin their own cloth, and scientists wanting art to help them communicate ideas that have become too complex for non-specialists. But there are also magical connections that reunite art and science as distinct but parallel ways of knowing. Then, something new happens, and you can get a glimpse of the wholeness of things and the infinite paths along which we can understand ourselves and the world that is existence. 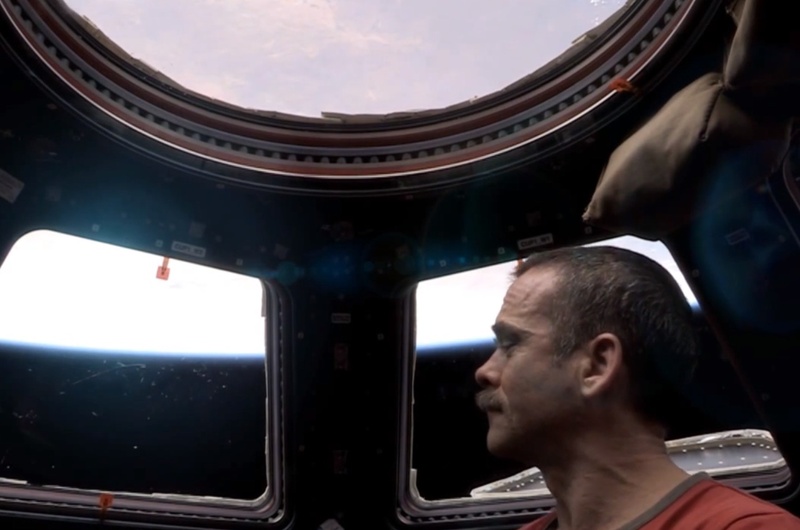 Commander Chris Hadfield has just posted a video of himself singing David Bowie’s Space Oddity on the International Space Station. It is beautiful and moving; the location and the singer adding resonance to a pop song that was slightly naive in its original creation. It suggests how far into the experience of being in space the earthbound Bowie’s imagination could take him. It also underlines how what we feel cannot but be part of what we know. Art and science reunited. And last night, I watched again the BBC film of Richard Feynman’s part in understanding the causes of the 1986 Challenger disaster. William Hurt gave an extraordinary portrayal of one of humanity’s most attractive geniuses, who united science, art and philosophy in his Tardis mind. So here is Richard Feynman speaking about the beauty of science in a way that I’m sure Chris Hadfield would understand perfectly. Thank you for this interesting article. Richard Feynman’s concept of the beauty of a flower is exactly where a lot of artists like myself are coming from – ‘artists using scientific material they do not understand as exotic stuff from which to spin their own cloth, and scientists wanting art to help them communicate ideas that have become too complex for non-specialists.’ is only part of the story, and there is a growing movement of polymath artists, some of whom have a science background, who seek much more depth in their investigation. Thanks for your comment. You’re right, of course, that there are many artists using scientific concepts and material with integrity and imagination. I’ve met quite a few in the past 20 years, in various contexts, but also seen work that struck me as facile. But that’s not exclusive to the connection between art and science: it exists throughout art and indeed throughout life. But I was very interested to see from your own site about the MA at St Martin’s. Your work for the degree show is beautiful and intriguing. I’m looking forward to reading/seeing more as you put it online.